Parking garage for 92 bicycles or 4 cars? 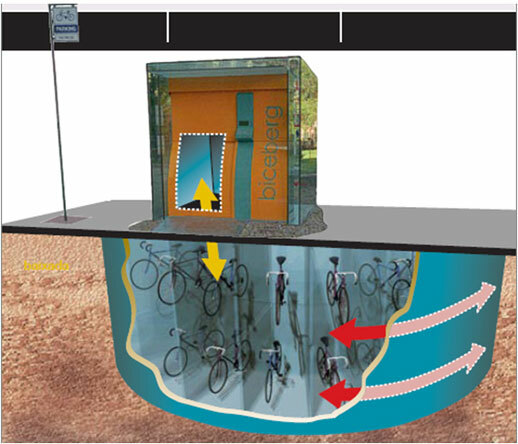 Automated bicycle parking garages are about to hit the tipping point. Tokyo (not surprisingly) was one of the first to provide the innovation (see previous entry) for hundreds of bikes at their congested train stations. Meanwhile, a company in Spain, Biceberg has figured out how to mass produce them in more manageable sizes. One of the most innovative government agencies in the U.S., the NYC Department of Transportation is probably already looking into similar solutions. What’s the big deal? Not only does parking for 92 bicycles replace the space for parking only 4 cars, but it doesn’t require an on-ramp and it removes one of the largest inconveniences of using a bike… securing it. Because the bike is stored in its own container, you can even leave other personal items in it. It takes approximately 30 seconds to retrieve your bike, which to many is about how long it takes to lock/unlock their ride, and the cost is apparently less than $30/year – need confirmation on that one. Check out this video explaining the need and how it works. If you just want to see how it works, skip to the 2:20 mark. Biceberg’s ‘bikeparks’ are in use in the Spanish cities of Zaragoza, Huesca, Blanes, Vitoria and Barcelona, with Catalonia, The Basque Country and Aragon on the way, followed by other cities in Europe. The company website even has civil engineering and installation documentation for construction and technical requirements on its website. Would you or people you know use a bikepark in your city? Comment below!